I've been playing The Long Dark for quite a while and know many of the maps fairly well. I've always been playing in Stalker Mode. Only sometimes I felt utterly challenged due too many coincidences happened at the same time as in weather changes and wolf struggles. 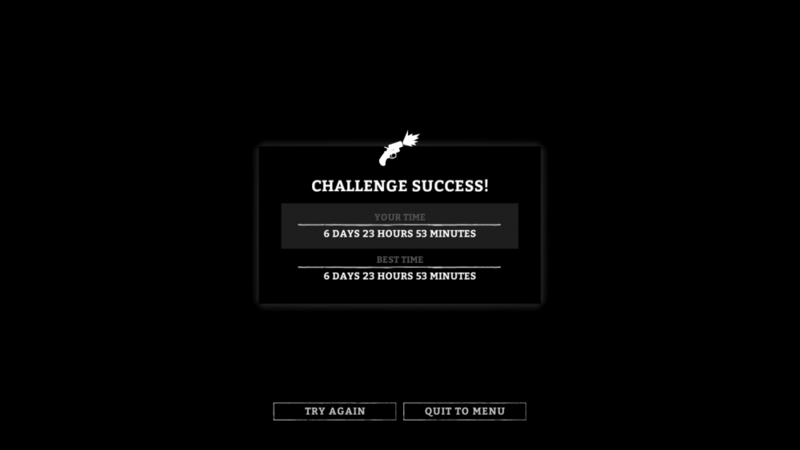 I even played The Hunted Part One which was quite nice but still not as challenging as my run in Hopeless Rescue. The following story is my most challenging walkthrough ever in The Long Dark. It was my second attempt. This story might contain spoilers! I started at Trapper’s Homestead grabbed all items that seemed to be useful the next 7 days and started my way in the direction of Camp Office – 5 hours of sunlight left; weather was good. On my way I collected some branches and finally reached the Camp Office without hassle. Once I reached Camp Office I looted the house, sewed my clothes to good quality, cooked some water and slept for 9 hours. May backpack was packed and the weather still good so I started walking eastwards over the frozen Mystery Lake. I reached the Southern Access when I heard a wolf growling at me. I ran to the nearest Fishing Cabin and reached it before stamina reached zero. I couldn’t hear anything walking behind me so I dared to look outside and where happy to see that a deer caught the wolf’s attention. I continued my way to Carter Hydro Dam which I reached without problems but very heavy loaded. I fought fluffy inside the building, cooked its meat, looted the dam and slept for 9 hours. My backpack was awfully heavy but I decided to keep everything - a decision I will reconsider in a few days. The weather was mainly good and so I could continue my way through the cave to Pleasant Valley and aimed to Pleasant Valley Outbuildings. However I arrived at Pleasant Valley Farmstead – 2 hours of daylight left, cold. I asked myself where I have turned the wrong way. I searched the house for clothes and medicine, slept for 8 hours and continued my journey early in the morning. I’m happily remembering that I found the rifle the last day. Nothing will happen to me now! The sun started to rise (awesome but freezing) and I aimed out for Timberwolf Mountain. I went straight west and struggled to find a way up the mountain. I reached the rope that leads to Timberwolf Mountain and allowed myself 2 hours rest in the Prepper’s Abandoned Cache to gain some warmth. The risk of hypothermia increased and the time flew unbelievable fast that I decided to start quickly even though fatigue was far advanced – I have the sneaky suspicion that my bag is planning to kill me. I continued my way to the Timberwolf Mountain. It is bright and the view is clear. I’ve been spending many hours on Timberwolf Mountain. If I hadn’t spent that much time on Timberwolf Mountain it would not have been possible to get on the summit in time. After passing Mountaineer’s Hut and the bear living west of it I reached a big cave where I stayed for the night. I checked on my status and felt good. There’s enough food left, flares and medicine for the worst case, a rifle and a plan to reach the summit. However there were only 3 days left. I was fairly confident to get everything done. The weather was good and the predators seemed to have no interest in me – a thought that will soon teach me the opposite. I woke up – 13 hours of daylight left – and started walking to the summit. I climbed the rope to the Secluded Shelf, untied that rope and made my way through the cave B to reach the exit of cave A. There was only one rope left to the summit; however this rope reminded me of a past try to climb up that rope without knowing that one have to rest on the ledges (bad experience). At this time fatigue at 100% and I was cold, very cold. I dropped all gear that wasn’t necessary, climbed up, reached the plane, or what was left of it and eventually caught hypothermia. This was the turning point of the story and will screw things up very badly. The good thing was, I wouldn’t know at this time. Hypothermia has never been a dangerous threat to me. I picked up the Distress Pistol, chopped all crates in the plan (and found useful things), made a big fire and slept for 10 hours. 5 hours of daylight and less than 2 days left for accomplishing Hopeless Rescue. I felt warm, awake and condition at 70%. While I was climbing down the rope a blizzard hit me so hard. I arrived at the bottom, picked up the dropped gear and found shelter in the cave that was in the vicinity. I was freezing and exhausted when I noticed that there is only one piece of wood in the cave. I started the fire, warmed up a bit, went outside hacked some wood, put it in the fire, warmed up, went outside again, hacked more wood and went back in. My condition now was hazardously low. I warmed up, slept as long as the fire lasted, which was only 5 hours and walked out of the cave into The Long Dark. Good thing, the blizzard had stopped. I totally underestimated this bloody hypothermia which drained so much energy of me and makes me walking too slowly. I dropped the first gear that I reckoned might not be necessarily needed. Even with the lantern equipped it is so difficult to see further than a couple of meters. I was prepared to light a flare and to shoot if a wolf comes into my way – to be more precise – if I come into the wolf’s way. I took the rope I brought from the Secluded Shelf and climbed down a steep abyss. Luckily I knew the way back to Crystal Lake – still pitch dark. I learned that when you are freezing and exhausted your condition decreases so fast there are only seconds to either find shelter or rest soon; or both. As time progresses fast I couldn’t stay too long in the Mountaineer’s Hut. I made a fire, slept for 2 hours and went back to Pleasant Valley – still very exhausted. My speed was too slow – but what could I do? I looked into my rucksack and dropped more gear. How much gear can I leave behind, what might I need later? Even if I dropped most of my gear I wouldn’t reach the 15kg that I’m able to carry due to permanent exhaustion. I reached Pleasant Valley – not much time left; not much energy either – but still enough to feel confident enough to succeed the challenge. I had to make a fire at the foot of the mountain I just climbed down. As there is no fire barrel in the Prepper’s Abandoned Cache I started the fire in the destroyed building beside it. 2 hours later I found myself walking in the direction of Point of Disagreement, night falling when a Blizzard hit my face with tremendous brutality. If my situation hasn’t been life-threatening yet – now it was. I made it to the Derelict Cabins. I analysed my situation thoroughly and fast. There is a blizzard which who knows how long it will go on for. It is pitch dark and temperature around minus 40° C. I am totally exhausted, freezing and condition at 70%. I’m full and not thirsty. At least I could rely on a permanent supply of food and water. Time left to succeed: 12 hours. I need the heat of a campfire and I need some rest. I went for wood and came back at condition at 30%. No worries I thought, I’ll make a fire and sleep for a couple of hours. I made a fire in the corner of the broken building and tried to sleep for two hours – I woke up freezing – fire gone out. There is no way to find anything positive in this situation, except for the fire must have gone out minutes before I woke up because my condition was still around 30%. The wind had changed direction so I went over to the other part of the house - same procedure. This time I slept for 2 hours - the campfire was still burning – and the blizzard still raging. With condition at 40% my situation is 30% worse than when I had arrived here and the storm won’t stop. No time for thoughts like: I’d better continued walking in the blizzard instead of stopping at the Derelict Cabins. I began to walk towards the Abandoned Mine. I saw a wolf strolling through the trough weather condition. I took my rifle, aimed as good as I could, shot and missed him. Luckily he run off frightened from the noisy shot. This was the first and last time I used the rifle. Equipped with the lantern I barely found the hill leading up to the Mine. The second time in this run I desperately watched my condition dropping to below 10%. I used the first of my three Emergency Stims and shortly afterwards the second and reached the Abandoned Mine. I didn’t have much in me, only 7%. I made a fire using accelerant and slept for another hour. I run through the mine with only little lantern fuel left – but with 16% condition – good news. Arrived on Coastal Highway exactly 6 hours left – sun is rising – temperature at minus 10° C – I made it through another night - I am happy. Now it was high time to drop everything that I won’t need any more just to carry 15kg. Why did I not do this earlier – next lesson learned. I am back at full speed. I passed Abandoned Lookout and headed to Coastal House until I came to a location that seemed new to me: a climbing rope. Good thing is it’s pointing downwards. Again, I am freezing. I started a campfire just for 10 minutes – time has become too precious. I made it to the Coastal House. I quickly searched for some reasonable clothes as the blizzard let my clothes suffer quite badly – didn’t find any. I continued walking with the Distress Pistol equipped knowing I will pass some wolf and bear paths. I reached Commuter’s Lament, passed the transmission zone and arrived at Abandoned Mine No. 3 (East). The temperature was 13° C which let me warm up completely. I was not surprised that I ran out of lantern fuel just right now. I lit a flare which by the way didn’t illuminate the cave properly. I wouldn’t find petroleum in the cave and finally managed to escape it and arrived on Desolation Point with still 16% condition and 30 minutes left. Eventually I dropped the lantern. Weather was alright until fog came up. I thought: I am I supposed to find the Lonely Lighthouse? I kept on walking down the road until the lighthouse appeared. My heart beat increased. I only had to walk over to the lighthouse and fire the Distress Pistol within the remaining 22 minutes. Did I experience all one can experience in The Long Dark? What’s the story with the wolf? I’m walking towards the lighthouse when I met the wolf. This is the perfect final after a long walk through The Long Dark. It’s still foggy; I’m full and not thirsty but totally exhausted as usual. I’m not freezing though. Okay, let’s fight - or run. If he gets me, I’m done. I took the Distress Pistol and shot at his direction – he flees. 20 minutes left. I am walking further. Another wolf – he is behind me this time, maybe he is running towards me. I shoot at him. Don’t know if I hit him. I’m using my last Emergency Stim. After days without much condition left I feel electrified. I am running towards the lighthouse (screenshot), entered it, run up the staircase onto the top of it with only minutes left and fired the Distress Pistol. I made it in 6 days 23 hours and 53 minutes; happy and exhausted. I need to find a place to rest. Hinterland created a game that is entertaining and challenging; even though it’s still in alpha version. 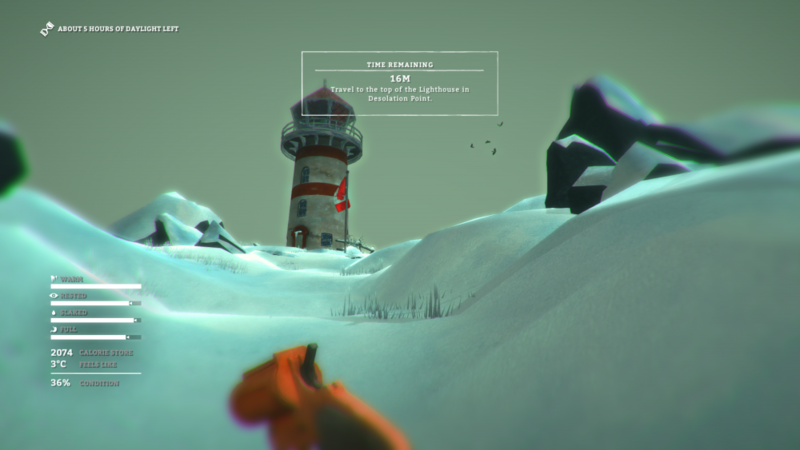 With adding challenges to the game The Long Dark has become more intense. I made many mistakes and learned many lessons. The most important lesson is: You can easily survive with only 15kg of baggage. I am not sure if the weather conditions were created by coincidence or programmed to hit the player as strong as they can in the most inappropriate situation. Either way this run was on the edge of both failure and success. Still impressed. Thank you Hinterland. Keep up the good work! Thx for sharing, a good read!